Adolfo Suárez Madrid–Barajas Airport (Spanish: Aeropuerto Adolfo Suárez Madrid-Barajas [aeɾoˈpweɾto aˈðolfo ˈswaɾeð maˈðɾið βaˈɾaxas]) (IATA: MAD, ICAO: LEMD), commonly known as Madrid–Barajas Airport, is the main international airport serving Madrid in Spain. At 3,050 ha (7,500 acres) in area, it is the second largest airport in Europe by physical size behind Paris–Charles de Gaulle Airport. In 2018, 57.9 million passengers used Madrid–Barajas, making it the country's largest and busiest airport and Europe's sixth busiest. The airport opened in 1928, and has grown to be one of the most important aviation centres of Europe. Located within the city limits of Madrid, it is just 9 km (6 mi) from the city's financial district and 13 km (8 mi) northeast of the Puerta del Sol or Plaza Mayor de Madrid, Madrid's historic centre. The airport name derives from the adjacent district of Barajas, which has its own metro station on the same rail line serving the airport. Barajas serves as the gateway to the Iberian peninsula from the rest of Europe and the world, and is a particularly key link between Europe and Latin America. The airport is the primary hub and maintenance base for Iberia. Consequently, Iberia is responsible for more than 40% of Barajas' traffic. The airport has five passenger terminals named T1, T2, T3, T4 and T4S. The airport was constructed in 1927, opening to national and international air traffic on 22 April 1931, although regular commercial operations began two years later. A small terminal was constructed with a capacity for 30,000 passengers a year, in addition to several hangars and the building of the Avión Club. The first regular flight was established by Lineas Aéreas Postales Españolas (LAPE) with its route to Barcelona. In the 1930s, flights started to serve some European and African destinations, the first international flights from the airport. 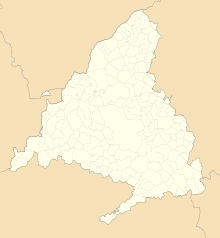 Originally, the flight field was a large circle bordered in white with the name of Madrid in its interior, unpaved, consisting of land covered with natural grass. It was not until the 1940s that the flight field was paved and new runways were designed. The first runway which started operation in 1944 was 1,400 metres long and 45 metres wide. By the end of the decade the airport had three runways, none of which exist today. In the late 1940s, scheduled flights to Latin America and the Philippines started. In the 1950s, the airport supported over half a million passengers, increasing to five runways and scheduled flights to New York City began. The National Terminal, currently T2, began construction in 1954 and opened later that year. In the Plan of Airports of 1957, Barajas Airport is classified as a first-class international airport. By the 1970s, large jets were landing at Barajas, and the growth of traffic mainly as a result of tourism exceeded forecasts. At the beginning of the decade, the airport reached the 1.2 million passengers, double that envisaged in the Plan of Airports of 1957. In the 1970s, with the boom in tourism and the arrival of the Boeing 747, the airport reached 4 million passengers and began the construction of the international terminal (current T1). In 1974, Iberia, L.A.E. introduced the shuttle service between Madrid and Barcelona, a service with multiple daily frequencies and available without prior reservation. The 1982 FIFA World Cup brought significant expansion and modernisation of the airport's two existing terminals. In the 1990s, the airport expanded further. In 1994, the first cargo terminal was constructed and the control tower was renovated. In 1997, it opened the North Dock, which is used as an exclusive terminal for Iberia's Schengen flights. In 1998, it inaugurated a new control tower, 71 m tall and then in 1999 the new South Dock opened, which implies an expansion of the international terminal. During this time, the distribution of the terminals changed: The south dock and most of the International Terminal were now called T1, the rest of the International Terminal and Domestic Terminal were now called T2 and the north dock was called T3. In November 1998, the new runway 18R-36L started operations (replacing the previous 18–36), 4,400 m long, one of the largest in Europe under expansion plans called Major Barajas. 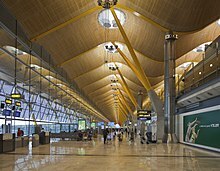 In 2000, it began the construction of new terminals T4 and its satellite, T4S, designed by architects Antonio Lamela, Richard Rogers and Luis Vidal. Two parallel runways to the existing ones were also built. 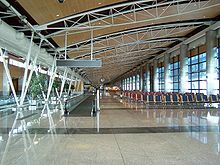 The new terminals and runways were completed in 2004, but administrative delays and equipment, as well as the controversy over the redeployment of terminals, delayed service until 5 February 2006. 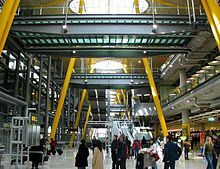 Terminal 4, designed by Antonio Lamela, Richard Rogers and Luis Vidal, (winning team of the 2006 Stirling Prize) and TPS Engineers, (winning team of the 2006 IStructE Award for Commercial Structures) was built by Ferrovial and inaugurated on 5 February 2006. Terminal 4 is one of the world's largest airport terminals in terms of area, with 760,000 square meters (8,180,572 square feet) in separate landside and airside structures. It consists of a main building, T4 (470,000 m²) and a satellite building, T4S (290,000 m²), which are approximately 2.5 km apart. The new Terminal 4 is designed to give passengers a stress-free start to their journey. This is managed through careful use of illumination, with glass panes instead of walls and numerous skylights which allow natural light into the structure. With this new addition, Barajas is designed to handle 70 million passengers annually. During the construction of Terminal 4, two more runways (15L/33R and 18L/36R) were constructed to aid in the flow of air traffic arriving and departing from Barajas. These runways were officially inaugurated on 5 February 2006 (together with the terminals), but had already been used on several occasions beforehand to test flight and air traffic manoeuvres. Thus, Barajas came to have four runways: two on a north–south axis and parallel to each other (separated by 1.8 km) and two on a northwest–southeast axis (and separated by 2.5 km). This allowed simultaneous takeoffs and landings into the airport, allowing 120 operations an hour (one takeoff or landing every 30 seconds). Terminals 1, 2 and 3 are adjacent terminals that are home to SkyTeam and Star Alliance airlines. Terminal 4 is home to Iberia, its franchise Air Nostrum and all Oneworld partner airlines. 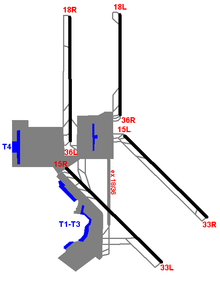 Gate numbers are continuous in terminals 1, 2 and 3 (A1 to E89), but are separately numbered in terminal 4 (H, J, K and M, R, S, U in satellite building). The Madrid–Barcelona air shuttle service, known as the "Puente Aéreo" (in Spanish), literally called "Air Bridge", is the busiest route between two European airports with 55 daily flights in 2012. The schedule has been reduced since the February 2008 opening of the Madrid–Barcelona high-speed rail line which covers the distance in ​2 1⁄2 hours. In 2007, the airport processed more than 52 million passengers. 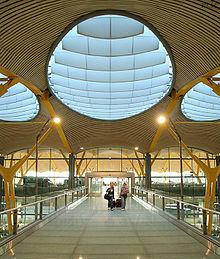 Barajas was voted "Best Airport" in the 2008 Condé Nast Traveller Reader Awards. In December 2010, the Spanish government announced plans to tender Madrid–Barajas airport to companies in the private sector for a period of up to 40 years. On 27 January 2012, Spanair suspended all flights affecting Madrid–Barajas as well as other domestic and international connections. On 20 September 2012, both runways 15/33 were renamed as 14R/32L (the longest) and 14L/32R (the shortest). On 1 August 2015, the first scheduled Airbus A380 flight landed in Madrid-Barajas in a daily service to Dubai by Emirates. Following the death of former Spanish Prime Minister, Adolfo Suárez, in 2014, the Spanish Ministry of Public Works and Transport announced that the airport would be renamed Aeropuerto Adolfo Suárez, Madrid–Barajas. This renaming seeks recognition for Suárez's role as the first Prime Minister of Spain after the restoration of democracy and his key participation in the transition to democracy after the dictatorship of Francisco Franco. The Madrid Metro Line connects the airport with city centre station Nuevos Ministerios in Madrid's financial district. The Barajas Line 8 provides a fast route from the underground stations at Terminal 2 (access to T1 and T3) and Terminal 4 into central Madrid. The metro also provides links to stations on the Spanish railway network. In October 2006, a bid was launched for the construction of a Cercanías link between Chamartín Station and Terminal 4. Now finished, this single Cercanías Line (C-1) links Madrid Barajas Terminal 4, with Chamartín Station and Atocha AVE high-speed train stations. In June 2011 a decision was made to equip this link with dual gauge which will allow AVE high-speed trains to reach the airport station. The Nuevos Ministerios metro station allowed checking-in right by the AZCA business area in central Madrid, but this convenience has been suspended indefinitely after the building of Terminal 4. EMT (Madrid Municipal Transport Company) runs regular public bus services between the airport and Madrid (Avenida de América station): bus 200 runs as a complete line – dropping passengers at departures of terminals 1, 2 and 4 before collecting passengers in the reverse order at arrivals. The EMT public night bus service N4 (nicknamed "Buho", Owl) also services from Madrid downtown (Plaza Cibeles) to Barajas (Plaza de los Hermanos Falcó y Alvarez de Toledo, 400m from the airport through a passageway above the highway). EMT also have an express bus linking Barajas airport to Renfe's Atocha Station, the main rail station in Madrid, during day and Plaza Cibeles during night. Unlike the two services mentioned above, this line runs 24 hours of the day during all the days of the year. In early 2006, the first driverless transit system in Spain and the longest airport people mover system in Europe began transporting passengers between the new terminal (T4) and a new satellite terminal (T4S). Deploying the CITYFLO 550 automatic train control technology, the system is the only mode of transportation for passengers between the two terminals, which are spaced more than two kilometres apart. Bombardier became the only contractor for the completely underground shuttle system, including the construction of the civil works, operation and maintenance of the system. Long- and short-term car parking is provided at the airport with seven public parking areas. P1 is an outdoor car park located in front of the terminal building; P2 is an indoor car park with direct access to terminals T2 and T3. A Parking 'Express' facility, available for short periods only, is located at Terminal 2 and dedicated long-term parking is also available with 1,655 spaces; a free shuttle operates between the long-stay car park and all terminals. There are also VIP car parks. On 30 September 1972, Douglas C-47B EC-AQE of Spantax crashed on take-off. The aircraft was being used for training duties and the student pilot over-rotated and stalled. One of the six people on board was killed. On 29 July 1979, as part of a triple attack, a bomb placed by ETA political-military killed three people. On 27 November 1983, Avianca Flight 011 crashed while attempting to land. Flight 011 struck a series of hills, causing the plane's right wing to break off. The 747 then cartwheeled, shattering into five pieces before coming to rest upside-down. Only 11 of the 169 passengers survived – there were no survivors among the 23 crew. On 7 December 1983, an Iberia 727 operating as Iberia Flight 350 collided during takeoff with Aviaco Flight 134, a DC-9 The Aviaco DC-9 had accidentally entered the runway as the Iberia flight was taking off. Ninety-three people were killed, including 51 from the Iberia 727 and 42 from the Aviaco DC-9. On 15 July 2006, the winglet of a Thai Airways International Boeing 747-400 HS-TGY operating flight TG943 from Madrid Barajas Airport in Spain to Rome Leonardo da Vinci-Fiumicino Airport cut off the tail of an Air France ERJ-145 while taxiing to the runway for take-off. No injuries were reported. On the morning of 30 December 2006, an explosion took place in the carpark building module D attached to Terminal 4. Authorities received a bomb threat at approximately 8:15 local time (7:15 GMT), with the caller stating that a car bomb carried with 800 kg of explosive would explode at 9:00 local time (8:00 GMT). After receiving the warning, police were able to evacuate part of the airport. Later, an anonymous caller stated that ETA claims responsibility for the bombing. As a result of the explosion, two Ecuadorians who were sleeping in their cars died. The whole module D of the car park was levelled creating around 40,000 tonnes of debris. It took workers six days to recover the body of the second victim from the rubble. On 20 August 2008, Spanair Flight 5022 which was travelling to Gran Canaria, veered off to the right and into the ground while climbing immediately after lifting off from runway 36L at 14:45 local time. The McDonnell Douglas (now Boeing) MD-82 with registration "EC-HFP", was carrying 172 people, including 162 passengers. In the accident, 154 people were killed, two were seriously injured and 12 were slightly injured. Prime Minister Zapatero ordered three days of national mourning. 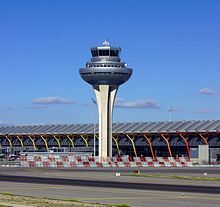 On 3 December 2010, during the Spanish air traffic controllers strike, Madrid–Barajas Airport remained inoperative when all Spanish air traffic controllers walked out in a coordinated wildcat strike. Following the walkout, the Spanish Government authorized the Spanish military to assume operation of air traffic control. On the morning of 4 December, the government declared a "State of Alert", ordering on the controllers back to work. Shortly after the measure was implemented, controllers started returning to work and the strike was called off. 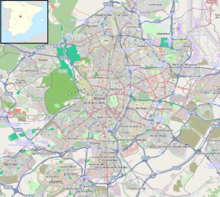 ^ "El aeropuerto de Madrid se llama desde hoy Adolfo Suárez" [From today the Madrid airport will be named Adolfo Suarez]. El Mundo (in Spanish). 24 March 2014. ^ a b "Madrid airport - Economic and social impact". Ecquants. Archived from the original on 22 February 2014. Retrieved 7 September 2013. ^ a b "AENA passenger statistics and aircraft movements". Aena. 2018. ^ "Air Navigation". Aena. Retrieved 29 June 2017. 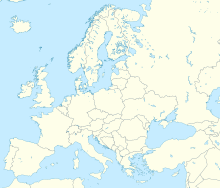 ^ "The Largest Airports in the World I: Europe". City Lines. Retrieved 20 April 2016. ^ "Top 10 Biggest and Largest Airports in the World 2015". www.abcnewspoint.com. Archived from the original on 13 April 2016. Retrieved 20 April 2016. ^ a b "History". Aena. Retrieved 30 June 2017. ^ "History". Ferrovial.com. Retrieved 30 June 2017. ^ "10 busiest airport pairs per number of daily flights". Eurocontrol. 15 November 2012. ^ "OAG reveals latest industry intelligence on the busiest routes" (Press release). OAG. 21 September 2007. Archived from the original on 26 October 2007. ^ "Readers' Travel Awards 2009". Condé Nast Traveller. Archived from the original on 15 August 2017. Retrieved 30 June 2017. ^ Otero, Lara (2 December 2010). "El Gobierno cambia de modelo y privatiza la gestión de aeropuertos" [Government changes its plan and privatizes airport management]. El País. Retrieved 29 June 2017. ^ Minder, Raphael; Clark, Nicola (30 January 2012). "Spain Threatens Fine After Airline's Quick Close". The New York Times. Retrieved 30 June 2017. ^ "El aeropuerto de Madrid- Barajas pasará a denominarse Adolfo Suárez, Madrid- Barajas" [The Madrid-Barajas airport will be renamed Adolfo Suárez, Madrid-Barajas] (Press release). Ministerio de Fomento de España. 24 March 2014. Archived from the original on 24 March 2014. Retrieved 24 March 2014. ^ Air Europa adds Casablanca service from June 2019 Routesonline. 6 December 2018. ^ "Air Europa delays Iguazu launch to August 2019". Routesonline. Retrieved 10 April 2019. ^ Air Europa adds Tunis service from June 2019 Routesonline. 28 December 2018. ^ a b c "Air Europa schedules seasonal European routes in S19". routesonline.com. Retrieved 9 July 2018. ^ MADRID 1ers vols à compter du 31 mars 2019 Air France. 26 October 2018. ^ "Air Serbia to launch nine new routes". Air Serbia. 23 January 2019. Retrieved 23 January 2019. ^ "Flight Schedule". Air Serbia. Retrieved 23 January 2019. ^ Calvo, Luis. "Estelar empieza a volar de Caracas a Madrid y Buenos Aires". Fly-News.es (in Spanish). Retrieved 2 March 2018. ^ Diana Ramón Vilarasau (28 April 2018). "Iberia refuerza su apuesta por EEUU" [Iberia reinforces its commitment to the US]. hosteltur.com (in Spanish). Retrieved 28 April 2018. ^ "Iberia Airlines to cancel South Africa-to-Spain route". www.thesouthafrican.com. ^ a b c d "El Grupo Iberia inaugurará ocho nuevos destinos en 2019". Retrieved 21 December 2018. ^ a b Liu, Jim (21 February 2019). "Iberia further expands European routes in S19". Routesonline.com. Retrieved 21 February 2018. ^ Press, Europa (13 December 2017). "Palermo y Miconos, nuevos destinos de Iberia Express para el próximo verano". Retrieved 6 April 2018. ^ "Bari y Zadar, nuevos destinos de Iberia Express para el verano de 2019". iberiaexpress. Retrieved 6 December 2018. ^ "IBERIA S19 European network additions as of 26DEC18". Routesonline. Retrieved 27 December 2018. ^ "Iberia lance un Madrid – Vatry". air-journal. Retrieved 29 January 2019. ^ "IBERIA S19 European network additions as of 26DEC18". Routesonline. Retrieved 28 December 2018. ^ MADRID1ers vols à compter du 31 mars 2019 Air France. 26 October 2018. ^ Mutzabaugh, Ben (28 November 2018). "Norwegian Air to fly from Miami, San Francisco; expand in Boston". KFMB Channel 8. KFMB-TV. Retrieved 28 November 2018. ^ "Ryanair W17 new routes as of 05MAR17". Routes Online. Retrieved 6 March 2017. ^ 2018, UBM (UK) Ltd. "Volotea schedules additional routes in S18". Retrieved 6 April 2018. ^ Da Silva, Gil (7 November 2018). "Bastia - Madrid, nouvelle ligne avec Volotea (Espagne)" (in French). QuelleCompagnie.com. Retrieved 13 November 2018. ^ "Wizz Air W18 Vienna expansion plan revision as of 26OCT18". routesonline.com. Retrieved 30 October 2018. ^ "Routes". Swiftair. Archived from the original on 23 April 2015. Retrieved 30 June 2017. ^ 2018, UBM (UK) Ltd. "Turkish Cargo adds 7 destinations in Jan 2018". Retrieved 6 April 2018. ^ "Dual gauge to enable high speed to Madrid Airport". Railway Gazette International. 8 June 2011. ^ "Inaugurado el intercambiador de Nuevos Ministerios en Madrid con servicio directo de metro al aeropuerto" [Nuevos Ministerios transfer station opens in Madrid with direct metro service to the airport]. Vía Libre (in Spanish) (454). June 2002. Archived from the original on 27 September 2007. ^ "Las aerolíneas descartan retomar la facturación en Nuevos Ministerios" [Airlines refuse to resume funding for Nuevos Ministerios]. ABC. Andén 2. 24 July 2007. ^ "Línea Exprés Aeropuerto" [Airport Express Line]. Municipal Transport of Madrid. 8 November 2010. Archived from the original on 8 November 2010. Retrieved 29 June 2017. ^ "Bombardier to Run INNOVIA System at Madrid-Barajas Airport for 10 More Years" (Press release). Aviation.ca. 20 December 2012. ^ "EC-AQE Accident description". Aviation Safety Network. Retrieved 7 September 2010. ^ ASN Aircraft accident Boeing 747-283B HK-2910 Madrid–Barajas Airport (MAD). Aviation-safety.net. Retrieved on 2 May 2011. ^ Accident Database: Accident Synopsis 12071983 Archived 15 September 2008 at the Wayback Machine. Airdisaster.com (7 December 1983). Retrieved on 2 May 2011. ^ Accident Database: Accident Synopsis 12071983 Archived 4 May 2008 at the Wayback Machine. Airdisaster.com (7 December 1983). Retrieved on 2 May 2011. ^ Accident Photo: Iberia 350 Archived 16 September 2008 at the Wayback Machine. AirDisaster.Com (7 December 1983). Retrieved on 2 May 2011. ^ "THAI clarifies incident concerning flight TG 943 routed Madrid – Rome". Travel Tips Asia. 18 July 2006. Retrieved 29 June 2017. ^ "Two Believed Dead in Madrid Airport Bombing". The New York Times. Reuters. 1 January 2007. Retrieved 30 June 2017. ^ "Madrid bomb shatters ETA cease-fire". Reuters. 31 December 2006. Retrieved 31 December 2006. ^ "Eta claims Madrid airport attack". BBC News. 9 January 2007. Retrieved 30 June 2017. ^ "Press conference, 21 August 2008" (Press release). 21 August 2008. Archived from the original on 8 April 2009. ^ Durán, Luis F.; Blasco, Pedro (26 August 2008). "La tragedia aérea de Barajas se salda con 153 muertos y 19 heridos, varios de ellos graves" [The air tragedy of Barajas leaves 153 dead and 19 wounded, several seriously]. El Mundo (in Spanish). Retrieved 29 June 2017. ^ "Spanish airports reopen after strike causes holiday chaos". The Guardian. UK. 4 December 2010. Retrieved 5 December 2010. ^ "Spanish air traffic controllers marched back to work as airports reopen". The Daily Telegraph. UK. 4 December 2010. Retrieved 5 December 2010. This page was last edited on 21 April 2019, at 04:28 (UTC).